Click Here to See Our Jeep Cherokees! When the time comes to find your Jeep Cherokee near Cambridge the best place to start, and probably end, is at Stockie Chrysler. The Jeep Cherokee is the perfect vehicle for anything. It has all the power, control, and potency you've come to expect from the Jeep brand, but with just a little bit of extra comfort and class thrown in for good measure. This is the vehicle for the weekend warriors. If your perfect idea of a Saturday afternoon is pushing the limits of civilization while still maintaining a little bit of comfort for yourself, then this is the crossover for you. When the wild calls, you will be thankful for the 60/40 split reclining rear seats, and enough extra hidden cargo space to put on a quality treasure hunt. This is a vehicle that can fit your life - no matter where it is taking place. With our world class sales team and best in the area selection, we are sure to find what you are looking for with a minimum of stress. If this sounds like the dealership for you, come see us at 150 Weber St S. in Waterloo, or give us a call at 855-292-1969 to book your appointment or test drive today! Stockie Chrysler is proud to be family owned and operated for two generations. Tell others about your great experience at Stockie Chrysler, and earn cash. Interested? Visit us today! We're pleased to give back to the people and places in our community. 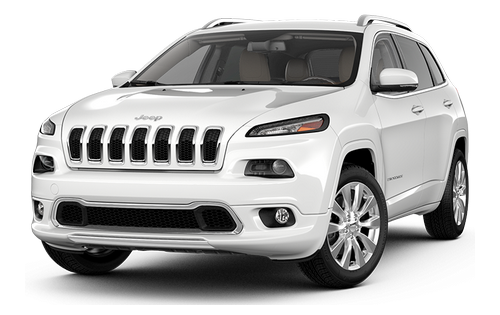 Purchase your Jeep Cherokee at Stockie Chrysler and help us give back! There are many features that the Jeep Cherokee wears proudly on its exterior. From it's available 17-inch off road aluminum wheels to the extraordinary available CommandView Dual Pane Sunroof, it is a marvel. Perhaps the most extraordinary thing, however, that the Cherokee brings to the table is it's unique look. This is a very cool looking crossover that, almost magically, looks at home in virtually every setting. We would be as pleased to see one in a parking spot at the grocery store in Cambridge as seeing one driving across the desert, and not every car can say that! The very coolest available feature that the burgeoning Cherokee owner will discover is the in-cluster display center. An all-in-one display behind the wheel that puts all the crucial information you need for your day to day trip in one place. From gas milage to trip information and temperature, this display does it all and it is highly customizable. If you are equipped with a few other available features such as Park-Sense or the Rear Park Assist, it can even help you park with an visual display. The future, it seems, was hiding right behind the wheel. Check out the customizable display on the Jeep Cherokee in-person at our store near Cambridge today! When it comes to safety features the Cherokee doesn't skimp. With more than 70 standard and available features this is the crossover that best has your back when the going tries to get tough. From Parking Assist, which guides you through tricky spots, to a Forward Collision Warning system which keeps you from getting too intimate with the neighbour ahead when you find yourself daydreaming, the available features will keep you rolling in the right direction. Let's Find you a Cherokee! At Stockie Chrysler we want to help you find your Jeep Cherokee near Cambridge. We have been serving your area for many years, and with your help, we hope to continue for a very long time to come. With our selection and expertise on your side, you can be sure that you will find the perfect Cherokee for you needs with no headaches at all. So, what are you waiting for? Come and see us today, and let's get started finding your dream vehicle! With two generations of incredible service behind us, the team at Stockie Chrysler is excited to pave the way to an amazing future! We're more than just a car dealership - we're your one-stop shop for everything automotive. It all starts on our lot, where you'll find an impressive inventory of new and used Chrysler, Dodge, Jeep, and Ram vehicles, each with the cool features and convenient technology that help take every trip from ordinary to extraordinary. Searching for a financing option that suits your budget? We can help with that, too. And if you're looking for a world-class service centre that can maintain that "like new" feeling for kilometres to come, you'll find it here. Stop by Stockie Chrysler today, and discover all the ways we go above and beyond for you! You can find us at 150 Weber Street S in Waterloo, ON, or call us at 855-292-1969. I would highly recommend Stockie Chrysler Dodge Jeep Ram for all your car needs. The team there is so helpful and very pleasurable. They made sure you felt right at home. Very comfortable and easy going. No pressure what so ever with the purchase of my new vehicle. Highly recommend!! So sweet, remembering me after just one visit (and checking in to see if my Jeep was still working fine), and gave me a discount on fixing my brakes after another Chrysler dealership screwed me over. Thank you guys! I was originally going to buy a brand new caravan but due my financial situation I was unable to purchase new. My salesman Tyrone Bond ended up finding me a 5 year older model for almost half the price with low kilometers in mint condition. All in all, great service!